Nowadays everyone in touch with modern fishing is aware that popping and jigging are taking the world by storm, particularly in Australia, Asia and the Pacific. For sure today these segments of the blue water fishing market are those with the highest growth rates. Techniques and equipment coming out of Japan over the last decade have accelerated this popularity and recently they have become more and more popular also in Europe. 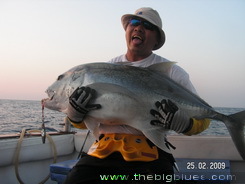 The Big Blues offers "Special Popping & Jigging Safari" to the Andaman Islands in India: a worldwide paradise for popping and jigging enthusiasts. You will never sea anywhere else such a variety of reefs and jigging areas so close to each other. Light tackle lovers will find as well awesome fishing grounds where to cast buck-tail jigs and medium stick-baits. From January till beginning of April each year The Big Blues organizes live aboard fishing safari starting from Port Blair in the Andaman Islands for a suggested minimum of 5 days/4 nights and a maximum of 6 guests on board. The itinerary is tailor made each time according to our guests' requests and of course to the weather and sea conditions at that time. The area is huge and we just started to scratch the surface while the variety of the different environments and the potentialities are really incredible. 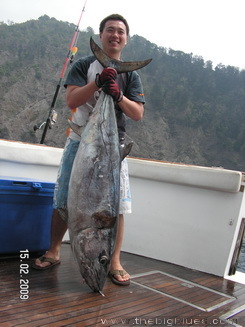 GT, Dogtooth Tuna and Grouper are the main dish but also Green and Rusty Jobfish, Bluefin Trevally, Black Trevally, Snapper, Coral Trout and Yellowfin Tuna will offer great entertainment. 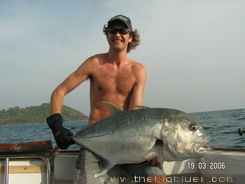 In the same way The Big Blues offers "Special Popping & Jigging Safari" to the famous Burma Banks in Myanmar. These offshore banks are a cluster of 20 sea-mounts, some of them still uncharted, rising from 400 meters of depth to just 10-30 meters below the surface. We are talking about open ocean fishing in this case; the closest islands in fact, part of the Mergui Archipelago, are 55-60 NM away. The area again is vast since some of the pinnacles are quite far from each other. The Big Blues offers liveaboard safari to the Burma Banks in Myanmar starting from Phuket in Thailand from February till the beginning of April each year. Trips are suggested for a minimum of 5 days/4 nights and are recommended for max 6 persons. No doubt that our popping and jigging safari will offer awesome fishing for the most adventurous anglers: during our expeditions in fact you will have the opportunity to explore remote areas, untouched waters, where we'll be alone most of the time in some of the last fishing frontiers on earth! 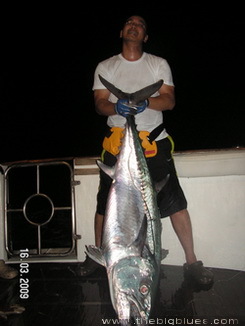 Fishing 24hrs a day, day and night is not uncommon and after a while you will lose all sense of time. *In general please note that we recommend all our guests who would like to go light tackle or popping & jigging, to always carry with them their own gear.